COMPARISON OF ENDOSCOPIC FINDINGS WITH GERD SYMPTOMS SCORE IN ZAGAZIG UNIVERSITY HOSPITALS, EGYPT. Background: Gastroesophageal reflux disease (GERD) may need repeated endoscopy for diagnosis and follow up, this may concern psychological and financial burden on patient. Aim of the work:The aim of our work was to evaluate the benefit of the FSSG as a useful and a practical tool for diagnosing of GERD patients compared to the endoscopic results. 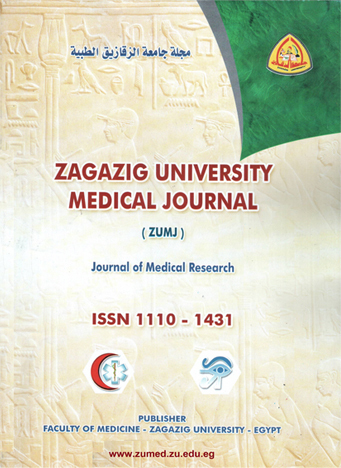 This was mainly to avoid repeated uses of endoscopy for diagnosis and may reduce the medical costs and save the patients time Patients & Methods: This study was carried out at Zagazig University, Faculty of Medicine, Internal Medicine Department, Gastroenterology and endoscopy unit during the period from June 2015 to December 2015.The subjects were 131 Egyptian patients aged ≥18 year (mean 46.3± 16.8 year; male/female ratio 1.8/1) who presented with symptoms of heartburn, regurgitation and epigastric pain or discomfort. They were scheduled for esophagogastroduodenoscopy. It was done after approval of Local Ethics Committee and patient’s consent was obtained. Pre-endoscopy Procedure: Our study depends on a simplified questionnaire for evaluation of the symptoms of GERD called FSSG (Frequency Scale for Symptoms of GERD) which consists of 12 questions; all must be answered by all subjects Endoscopy Procedure: All subjects underwent esophagogastroduodenoscopy. The results of endoscopy were classified and graded according to Los Angeles classification into GERD A, B and C according to the severity of the endoscopic findings. After that the final endoscopic diagnosis was compared to the predicted diagnosis resulting from the Regression model and Equation. Results: Based on the endoscopic findings, the number of patients with GERD Los Angeles Class A, B and C was 18.3, 15.3 and 6.9 % respectively. Clinical obesity patients were 3 distributed as duodenal ulcer (DU) = 2 and GERD B = 1 patient. Overweight patients were 58 distributed as gastric ulcer (GU) = 13, DU = 7, functional dyspepsia (NUD) = 14, GERD A = 8, GERD B = 8 and GERD C = 8 patients. Normal weight patients were 63 distributed as GU = 14, DU = 11, NUD = 11, GERD A = 16, GERD B = 10 and GERD C = 1 patients. Underweight patients were 7 distributed as DU = 1, GU = 2, NUD = 3, GERD A = 0, GERD B = 1 and GERD C = 0 patients. Usage of the FSSG questionnaire with Regression Model help us to predict strongly GERD A by 95.8%, also GERD B by 95% and weakly predict DU by 81.8%, GERD C by 77.7%, GU by 60.7% and NUD by 50%.Conclusion: Noninvasive assessment tool FSSG questionnaire was useful for objective evaluation of symptoms in GERD patients and avoid repeated endoscopic examination which is undesirable in terms of medical costs and the burden on the patient and save our developing country efforts and resources.